Making grilled cheese sandwiches is not rocket science. Most people have their “method” and it’s all good. We are talking about toasted bread and melted cheese, after all. Unless you burn your sandwich, how is that ever going to be bad? A couple of years ago I read an article that suggested using mayonnaise on the outside of the bread when making grilled cheese sandwiches. My husband has always like a little schmear of mayonnaise inside his grilled cheese sandwich, but I’d never heard of using it on the outside. You don’t need as much mayonnaise to cook a grilled cheese as you do butter. Mayo easier than butter, and all you need is a light spread on the outside of the bread for a deliciously brown, crisp exterior. Mayonnaise contributes more flavor to a sandwich than butter. Mayonnaise has a higher smoke point than butter, so it won’t burn as easily. This allows you to cook the sandwich long enough to fully melt the cheese without burning the outside of the sandwich. 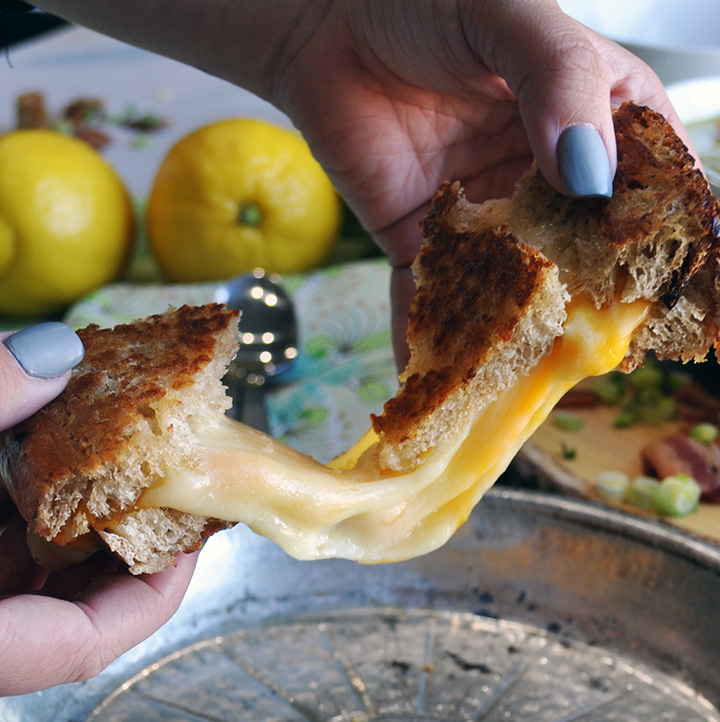 So, that’s the secret to a great grilled cheese sandwich. Although, let’s not neglect the cheese. Or the bread. When a sandwich relies on 2 main ingredients, it’s important to not skimp on either. Get the highest quality bread you can find. I bake a couple loaves of sourdough every week, so that’s what I use. If you’re not a bread baker, pick up a sturdy, hearty, rustic loaf at your local market. Slice it on the thick side so that there’s plenty of bread to hold all that cheese. 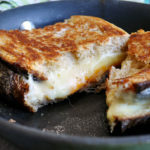 I think the best cheeses to use inside a grilled cheese sandwich are gruyere, fontina, mahon, cheddar, havarti, Swiss, provolone and pepper jack. Use only one variety, or a combination, but all these cheeses melt deliciously. Spread one side of both pieces of bread with mayonnaise – just enough to coat the surface or each with a thin layer. Lay one slice of bread in the hot skillet, mayonnaise side down. Layer the sliced cheese over the bread then top with the second slice of bread, mayonnaise side up. Turn the heat down to medium-low. 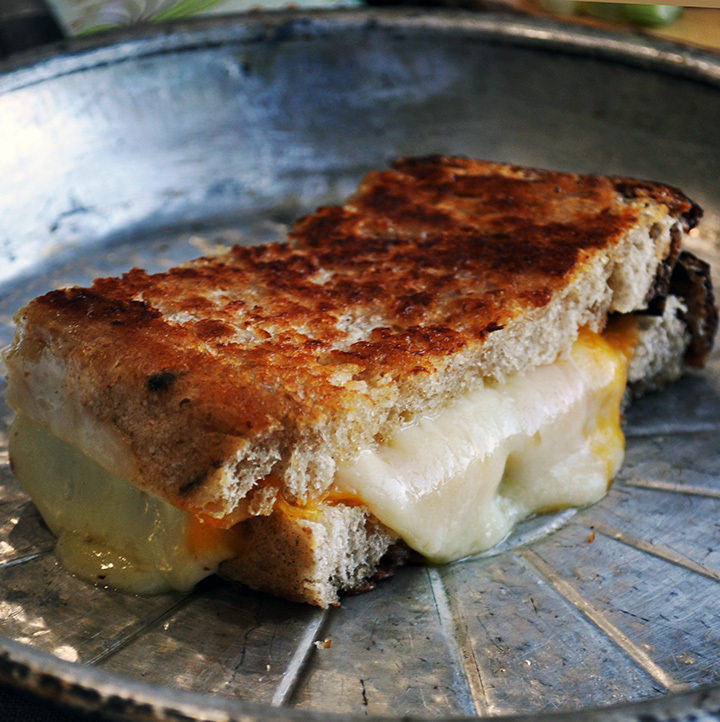 When the cheese looks about halfway melted, use a spatula to flip the sandwich over in the pan. Use the spatula to press the sandwich down slightly. Let cook for a couple of minutes, then peak underneath. If the bread is getting too brown, flip the sandwich back over. Continue flipping back and forth every 30 seconds or so to let the cheese melt fully without burning the outside of the bread. Flip the sandwich out onto a plate and serve.